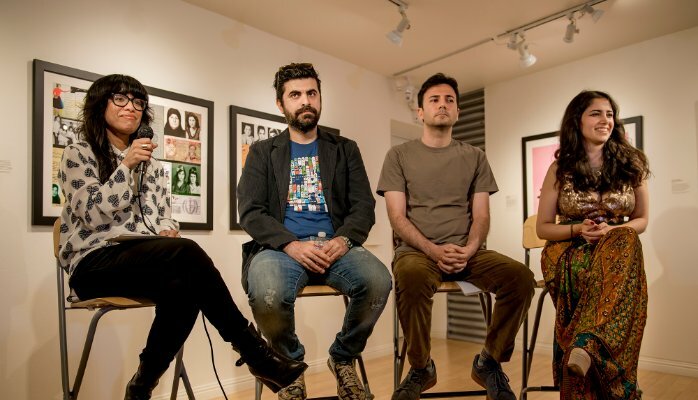 During Sunday’s Focus Iran: Contemporary Photography and Video discussion at Los Angeles’ Craft and Folk Art Museum, conceptual artist-writer Marjan Vayghan waxed enthusiastic about the similarities between Tehran and L.A. I was elated to hear someone publicly articulating what I’d been feeling for the past two years since researching and developing my current screenplay, which explores the vast connections between black American culture and Iranian immigrants living in the Southland. Born in Tehran in 1984, Vayghan emigrated to the United States from Tehran in the spring of 1995, residing with her family in a West Los Angeles apartment building on Brockton Avenue–a block from University High School, my alma mater. Marjan now lives in L.A. and Tehran, and her work is informed by this fluid movement and flexible citizenship across geographical and cultural spaces, and the expressions these dual realities provoke. What are some of the similarities that you see between Tehran and L.A.? The people, the weather, the food, like it’s chill but, ‘Don’t mess with me.’ Culturally, it’s the fact that I can live here and live there and not really change my personality all that much except for putting on a scarf. You can just be yourself in both places. There’s certain places where I’m weirder than others. But a lot of things that are weird in L.A. are weird in Iran, and visa versa. The weather is eerily similar. Like whatever’s happening there weather-wise is usually mirroring its way here: They’re having a drought. We’re having a drought. So it’s just one of these things where there’s a lot more happening that is similar than is different. And the people themselves are the nicest people in the world unless you mess with them: Very L.A. Very Tehran. Other people in Iran would say, ‘Oh the people in Tehran, they’re so rude.’ Or like, they drive badly, ‘They drive like maniacs.’ Totally reminds me of L.A. Really not that different. It doesn’t freak me out at all. I’ve found through my screenplay project that black and Iranians are also more alike than not. Yeah! They’re extremely similar. When I moved here and went to high school it was actually really funny because there was this weird thing in our high school, I went to Uni High, and I thought we were the same race of people for the longest time. I mean, we hung out in the same places, and it’s not some big thing. I don’t know. A lot of things that are common in the culture, they enjoy in Tehran…food, music. I mean, I hear a lot more American music blasting out of cars when I’m Tehran than I do when I’m in L.A.
Now here’s another coincidence—I went to Uni, too! You went to Uni! When were you there? I was there in 2002 when the Persians had taken over. There were Persians there in the ’80s, for sure. Oh, see, I didn’t know they were Persians at Uni there that far back! We’ll leave that for our more than two minute conversation! Focus Iran: Contemporary Photography and Video features living artists whose works explore diverse perspectives of contemporary Iranian culture and the Iranian diaspora. The exhibit is sponsored by the Farhang Foundation and continues at the Craft & Folk Art Museum through May 3, 2015.